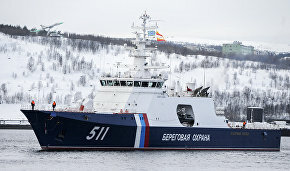 The lead vessel in the Elbrus (Project 23120) multifunctional logistics support class has started service with Russia's Northern Fleet, Captain First Class Vadim Serga, head of the Northern Fleet's press service, told reporters. The Elbrus combines the properties of a rescue tug and transport ship. It can transfer cargo to shore and other ships in high latitudes with an ice thickness of over half a meter. The vessel is equipped with a pressure chamber for decompression of divers, and therefore can participate in rescue operations and provide medical assistance to distressed submariners. "The Project 23120 lead multifunctional logistics support vessel, the Elbrus, held the Russian Navy auxiliary fleet flag-raising ceremony today at the Northern Fleet main base in Severomorsk. From now on, the ship is listed in the group of support vessels of the united strategic command of the Northern Fleet," Serga said. The Elbrus, built at St. Petersburg's Severnaya Verf shipyard, has been conducting a series of at-sea tests in the Barents Sea since the beginning of September 2017. Ka-27 helicopters buzzed the ship at the Northern Fleet training grounds; its propulsion unit, auxiliary systems and mechanisms were tested in various modes of operation. 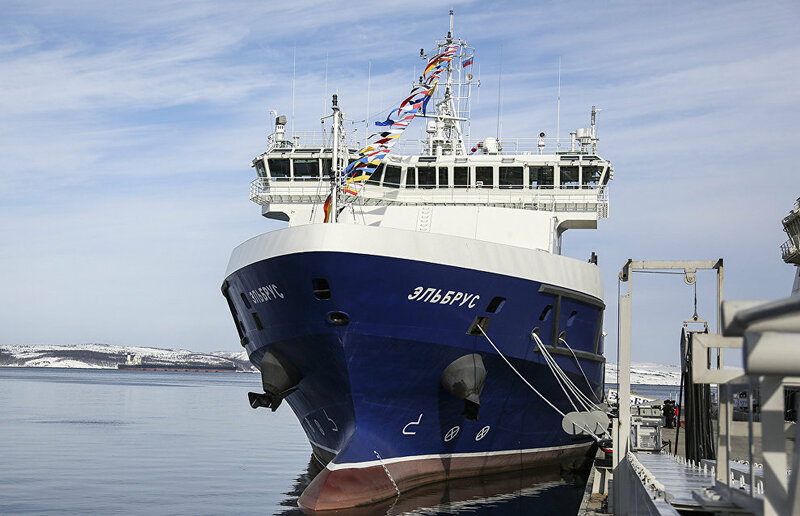 Based on the results of all tests, the vessel, the first multifunctional ice-class transport ship capable of operating in the Arctic, was accepted into the Northern Fleet. With its modern radar and hydroacoustic equipment, the Elbrus is capable of locating sunken objects and mapping the seafloor relief. Its steerable propellers improve the ship's maneuverability, rotating around their own axis by 360 degrees and keeping the vessel at a given location in all weather. The Elbrus has two electrohydraulic cranes with a lifting capacity of 50 tons, towing winches with a pulling force of 120 and 25 tons. Its over 700 square meter cargo deck is large enough to carry open sea transport containers. The crew of the ship consists of 55 people. Severnaya Verf is currently building the second Project 23120 ship, the Vsevolod Bobrov.